The St. John Fisher Cardinal Baseball Team spent their weekend in Ithaca, New York facing off in three separate games against the Bombers from Ithaca College. The Cardinals fell in both games of the doubleheader that took place on Saturday by scores of 4-3 and 2-1. In the first matchup against the Bombers, Junior Justin Graham made a diving grab in foul territory to make an incredible out. A video of the catch ended up making its way to ESPN and was featured as the number one top play of the weekend on Sportscenter. The two losses snapped a six-game winning streak for the Cardinals and moved their overall record to 17-9. After facing the Bombers from Ithaca one final time on Sunday, the Cardinals will travel to Brockport on Tuesday, April 16. The Men’s Golf Team claimed their ninth straight Empire 8 Championship on Sunday, April 14 shooting a combined team score of 63 over par over two days. Chris Thompson had the top score for the Cardinals shooting a combined score of 14 over par, which won him First-Team All-Conference honors. With the victory, the Cardinals were awarded an automatic berth to the NCAA Division III Men’s Golf Championships in Nicholasville, Kentucky this May. The Cardinals will have one more tournament to play in before the championship when they travel to Hamilton, New York on Saturday, April 20 for the RTJ Individual Shootout. The Cardinals will hope to perform well in both the shootout and championships with five All-Conference selections competing. Along with Thompson, Colin McGaugh was awarded first-team. Michael Long, Nicholas Calabrese, and Andrew Fedele were all awarded second-team honors. The Women’s Golf Team has been on a small break in their schedule as they prepare for the Ithaca College Invitational on the weekend of Sunday, April 21. The two-day event will be played at the Country Club of Ithaca. In their last time out, the Cardinals placed third as a team in the McDaniel Spring Invitational played at The Bridges Golf Club in Abbottstown, Pennsylvania. Senior Maggie Lesch finished in eighth place overall while Sophomore Emily Schultz placed 12th to lead the Cardinals. Continuing their stellar season, the men’s lacrosse team beat Hartwick by a score of 25-12 at home on senior night. 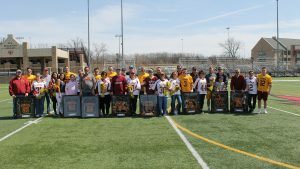 The Cardinals celebrated eight graduating players prior to the game which included Chance Gates, Kyle Halladay, Alex Hunt, Danny Turck, Zach Wagner, Mitch Rein, Shane Rickard, and Ryan Obrist. With the victory, the Cardinals improved their overall record on the season to 12-1. The Men’s Lacrosse Team will break for a week and then return to close their regular season with three final Empire 8 matchups starting on Saturday, April 20. Only one of the three games will be played at Growney Stadium, and that is against Alfred University on Wednesday, April 24. 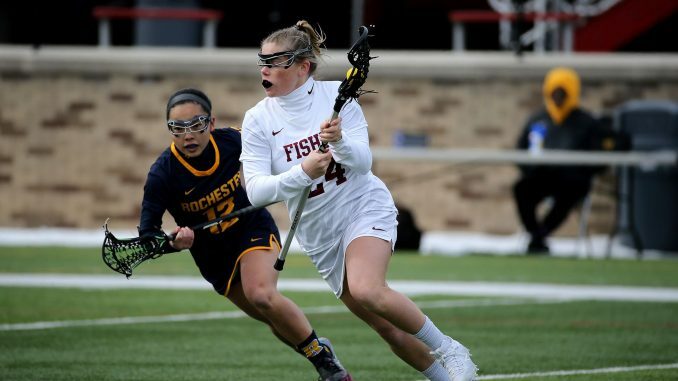 The women’s lacrosse team extended their win streak to 11 games on Saturday, April 14 defeating Hartwick College by a score of 13-3. Senior Mary Grace Doyle led the Cardinals in scoring with four goals in the game. The Women will also break for a week and return on Saturday, April 20 to face off against Stevens at Growney Stadium. The Men’s Rowing Team placed second against both Ithaca and SUNY Geneseo at the Cayuga Inlet on Sunday, April 7. Dylan MacQuoid, Jeremiah Boerman, Sean Brosnan, Nick Rino, and Oscar Villalta were in the boat for the Cardinals as they crossed the finish line with a time of 7:59.2. The Cardinals will travel to SUNY Geneseo for their next meet as they compete in the SUNY Invitational on Saturday, April 20. The women’s rowing team was also in action on the Cayuga Inlet as Kelly Vanderwall, Alexandra Hartung, Catie Healey, Savannah Elliott, and Hannah Smith took second place overall in the women’s varsity four. The Cardinals will travel along with the men to SUNY Geneseo for the SUNY Invitational on Saturday, April 20 for their next meet. The Cardinal softball team split a doubleheader this weekend against Alfred University on Saturday, April 13. The Cardinals were shut out in their first matchup losing by a score of 1-0, but bounced back with a 5-0 victory in the afternoon game. The win and loss effectively moved their overall record to 16-13. The Cardinal’s will face off in another doubleheader their next time out against Houghton College on Thursday, April 18. The men’s tennis team snapped a two-match losing streak on Saturday, April 13 defeating The Sage Colleges by a score of 9-0. The Cardinals received singles victories from John Miller, Dustin McCullough, Tim Christman, Jordan O’Connell, and Kyle Gorman in the shutout victory. The victory improved the Cardinal’s overall record on the season to 2-9 and 2-2 in conference play. The Cardinals will return home on Sunday, April 14 to face Elmira before heading back out on the road to face both Nazareth and Alfred. The men’s track and field team placed third overall at the University of Rochester Alumni Invitational on Sunday, April 14. Senior Eddie Mahana placed second in both the 400 and 200-meter races which qualified him for the Atlantic Regional Meet on May 15. Ross Mathewson shined in the field events for the Cardinals placing first in the hammer throw event with a throw of 51.77 meters. The Cardinals will travel to Chester, Pennsylvania on Friday, April 19 to compete in the Widener University Invite before returning home on the 27th for the Cardinal Classic at The Polisseni Track and Field Complex. The women’s track and field team one-upped their male counterparts placing second overall on the women’s side of the University of Rochester Alumni Invitational. Clarissa Hensler won the 10,000-meter race, and Taylor Dence also claimed first in the 100-meter race with a time of 13:02. Along with Hensler, Gabriella Dunkelberg also qualified for the Atlantic Regional Meet in May. The Cardinals women will travel to Chester, Pennsylvania on Friday, April 19 to compete in the Widener University Invite, and then return home for the Cardinal Classic before heading to Houghton on Friday, May 3 for the Empire 8 Championship. The men’s volleyball team’s season came to a close on Saturday, April 14 when they fell to New Paltz 3-1 in the second round of the UVC Conference Championship. After defeating Vassar College 3-1 in the first round, the Cardinals fell just short of advancing to the finals against Stevens College. Freshman Josh Bigford finished the season leading the team in kills with 421, and sophomore Paul Hackford led the team in assists with 968 on the season. Graduating only three players, the Cardinals will look to return to strong form next season.